Overview map of the world at the end of the 3rd millennium BC, color coded by cultural stage. The red outline indicates the extent of the Bronze Age at the time. The 3rd millennium BC spanned the years 3000 through 2001 BC. This period of time corresponds to the Early to Middle Bronze Age, characterized by the early empires in the Ancient Near East. In Ancient Egypt, the Early Dynastic Period is followed by the Old Kingdom. In Mesopotamia, the Early Dynastic Period is followed by the Akkadian Empire. World population growth relaxes after the burst due to the Neolithic Revolution. World population is largely stable, at roughly 60 million, with a slow overall growth rate at roughly 0.03% p.a. The Bronze Age occurred roughly between 3000 BC and 2500 BC. The previous millennium had seen the emergence of advanced, urbanized civilizations, new bronze metallurgy extending the productivity of agricultural work, and highly developed ways of communication in the form of writing. In the 3rd millennium BC, the growth of these riches, both intellectually and physically, became a source of contention on a political stage, and rulers sought the accumulation of more wealth and more power. Along with this came the first appearances of mega architecture, imperialism, organized absolutism and internal revolution. The civilizations of Sumer and Akkad in Mesopotamia became a collection of volatile city-states in which warfare was common. Uninterrupted conflicts drained all available resources, energies and populations. In this millennium, larger empires succeeded the last, and conquerors grew in stature until the great Sargon of Akkad pushed his empire to the whole of Mesopotamia and beyond. It would not be surpassed in size until Assyrian times 1,500 years later. In the Old Kingdom of Egypt, the Egyptian pyramids were constructed and would remain the tallest and largest human constructions for thousands of years. Also in Egypt, pharaohs began to posture themselves as living gods made of an essence different from that of other human beings. Even in Europe, which was still largely neolithic during the same period, the builders of megaliths were constructing giant monuments of their own. In the Near East and the Occident during the 3rd millennium BC, limits were being pushed by architects and rulers. c. 2700 BC–1600 BC: Old Elamite period. c. 3000 BC: Nubian A-Group Culture comes to an end. c. 2300 BC: Nubian C-Group culture. 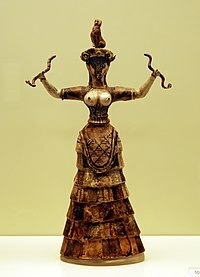 c. 3200 BC: Cycladic culture in Aegean islands of Greece. c. 3200 BC–3100 BC: Helladic culture in mainland Greece. c. 3200 BC–2800 BC: Ozieri culture. Corded Ware culture (also Battle-axe culture, or Single Grave culture). Yamnaya culture, Catacomb culture, likely loci of Indo-European Satemization. 2800 BC–2600 BC: Harappan 2. 2600 BC–1900 BC: Harappan 3 (Mature Harappan). c. 2500 BC: Austronesian peoples from Formosa colonize Luzon in northern Philippines. c. 3700 BC: Lothal: Indus Valley trade-port city in India. c. 3650 BC–3000 BC: Minoan culture appeared on Crete. c. 3200 BC/3100 BC: Helladic culture and Cycladic culture both emerge in Greece. c. 3000 BC: Unification of Upper and Lower Egypt. c. 3000 BC: First evidence of gold being used in the Middle East. c. 3000 BC: Nubian A-Group, Ta-Seeti "kingdom" came to an end, possibly due to raids by Egypt. c. 3000 BC–2000 BC: Vessels from Denmark are made; they are now at National Museum, Copenhagen. c. 2890 BC: Second Dynasty of Egypt, reign of Hotepsekhemwy. Syria: Foundation of the city of Mari (29th century BC). Semitic tribes occupy Assyria in northern part of the plain of Shinar and Akkad. Phoenicians settle on Syrian coast, with centers at Tyre and Sidon. Beginning of the period of the mythical Sage Kings in China, also known as the Three Sovereigns and Five Emperors. c. 2879 BC: Rise of the mythical Văn Lang Kingdom and the Hồng Bàng Dynasty in northern Viet Nam. c. 2800 BC–2700 BC: Harp Player, from Keros, Cyclades, was made. It is now at the Metropolitan Museum of Art, New York. Iran: Creation of the Kingdom of Elam. Germination of the Bristlecone pine tree "Methuselah" about 2700 BC, one of the oldest known trees still living now. c. 2686 BC: Third Dynasty of Egypt, reign of Sanakhte. c. 2613 BC: Fourth Dynasty of Egypt, reign of Sneferu. c. 2600 BC: Founding of the Chalcolithic Iberian civilizations of Los Millares and Zambujal. 2600 BC: Unified Indus Valley Civilisation. c. 2500 BC: The state of Assyria is established. c. 2500 BC: Excavation and development of the Hypogeum of Ħal-Saflieni at Paola, Malta, a subterranean temple complex subsequently used as a necropolis. c. 2500 BC–2200 BC: Incised panel "Frying pan", from Syros, Cyclades is made; it is now at the National Archaeological Museum, Athens. c. 2500 BC–2200 BC: Two figures of women, from the Cyclades, are made; they are now at Museum of Cycladic Art, Athens. Dynasty of Lagash in Sumer. 2474 BC–2398 BC: Golden age of Ur in Mesopotamia. c. 2498 BC: Fifth Dynasty of Egypt, reign of Userkaf. c. 2492 BC: The Armenian patriarch Hayk defeats the Babylonian king Bel (legendary account). c. 2345 BC: Sixth Dynasty of Egypt, reign of Teti. 2334 BC: Sargon of Akkad conquers Mesopotamia, establishing the Akkadian Empire. c. 2300 BC: C-Group pastoralists arrive in Nubia. c. 2181 BC: Seventh and Eighth Dynasty of Egypt (2181–2160). c. 2160 BC: Ninth Dynasty of Egypt, reign of Akhtoy Meryibtowe. c. 2130 BC: Tenth Dynasty of Egypt, reign of Meryhathor. c. 2134 BC: Eleventh Dynasty of Egypt, reign of Mentuhotep I.
Megalithic, Corded Ware culture and the Beaker flourish in Europe. Sumerian poetry, lamenting the death of Tammuz, the shepherd god. Sumerian cuneiform writing (reduces pictographs still in use to about 550 BC). Major religious festival in Sumeria celebrates victory of god of spring over goddess of chaos. Beginning of the Pengtoushan culture in China. The world's last surviving mammoth population, on Wrangel Island in the Arctic Ocean, goes extinct, sometime between 2500 and 2000 BC. c. 2070 BC–1600 BC: The legendary Xia Dynasty in China. Imhotep, first known architect, physician and engineer in Ancient history. The Three Sovereigns and Five Emperors of China. Gilgamesh, fifth king of the First Dynasty of Uruk, immortalized in the world's first literary work the Epic of Gilgamesh (c. 26th century BC). Khufu, king of Egypt, builder of the Great Pyramid of Giza. Urukagina, king of Lagash, creates the first known judicial code (24th century BC). Lugalsaggizi, king of Uruk and Umma conquers Lagash (2371 BC–2347 BC). Sargon the Great, founder of the empire of Akkad and Sumer (2371 BC–2316 BC middle chronology). Ur-Nammu founder of the 3rd dynasty of Ur (2112 BC–2095 BC middle chronology). Great Pyramid of Giza, Kheops. 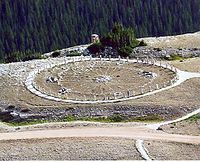 The Medicine Wheel in Bighorn National Forest, Wyoming, United States. c. 3500 BC: Indus script develops in Indus Valley Civilization. Pottery develops in Americas (30th century BC). c. 3000 BC: Potter's wheel appears in Mesopotamia. 2900 BC–2400 BC: Sumerians invent phonogram (linguistics). 2650 BC: Reservoirs, script, metals and pottery used in the city of Dholavira in Indus Valley Civilization. c. 2300 BC: Metals are used in Northern Europe. Building of the Great Pyramid of Giza (26th century BC). Sails used on ships (20th century BC). First ziggurats built in Sumer. Near East civilizations enter Bronze Age around 3000 BC. Oldest known medicine wheel constructed in the Americas. First Copper (~2500 BC) and then Bronze (~2000 BC) and other types of metallurgy are introduced to Ireland. Domestication of the horse with the coming of Indo-Europeans in central Eurasia. The chariot emerges in Central Asia just before 2000 BC. The camel (dromedary) domesticated (though widespread use took until mid-to-late 2nd millennium BC). Indoor plumbing and sewage in the Indus Valley Civilization. Sumerian medicine discovers the healing qualities of mineral springs. Weaving loom known in Europe. Sumerian numerical system based on multiples of 6 and 12. Egyptians discover use of papyrus. Austronesian peoples have developed lanteen sail, and the out-rigger as well as extensive development of celestial navigation systems. Oldest known evidence of the inhalation of cannabis smoke, as indicated by charred cannabis seeds found in a ritual brazier at a burial site in present-day Romania. c. 3000 BC–2500 BC: Tomb, Newgrange, Ireland, was built. 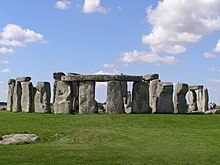 c. 2750 BC–1500 BC: Stonehenge, Salisbury Plain, Wiltshire, England, is built. Completion of the Great Pyramid of Giza. Completion of first phase of Stonehenge monument in England. Era of Buena Vista pyramid/observatory in Peru. The Sydney rock engravings in Sydney, Australia, which are examples of Aboriginal rock art, date from around 3000 BC. ^ "The Bronze Age on the Greek Mainland: Early Bronze Age – Early Helladic I". Athens: Foundation of the Hellenic World. 1999–2000. ^ Eckholm, Erik (10 November 2000). "In China, Ancient History Kindles Modern Doubts". The New York Times. ^ Scarre, Chris (1993). Smithsonian Timelines of the Ancient World. p. 176. ISBN 978-1-56458-305-5. Both the dromedary (the one-humped camel of Arabia) and the Bactrian camel (the two-humped camel of Central Asia) had been domesticated since before 2000 BC. ^ Bulliet, Richard W. (1990) . The Camel and the Wheel. Morningside Book Series. New York: Columbia University Press. p. 183. ISBN 978-0-231-07235-9. As has already been mentioned, this type of utilization [camels pulling wagons] goes back to the earliest known period of two-humped camel domestication in the third millennium BC. ^ Rudgley, Richard (2000) . Lost Civilisations of the Stone Age. New York: Touchstone (Simon and Schuster). p. 138. ISBN 978-0-684-85580-6. This page was last edited on 18 January 2019, at 17:15 (UTC).